This weekend, FotoFocus hosted events at the Contemporary Arts Center for the 25th Anniversary of the acquittal of the museum for obscenity charges related to showing photographs by Robert Mapplethorpe. The conversations reminded me of a more recent art experience with Sheriff Simon Leis. Simon Leis was "the sheriff whose deputies cleared out the Contemporary Arts Center...and hand-delivered indictments on obscenity charges to its director, Dennis Barrie," marking the first-ever criminal charges of a museum for an exhibition. But many people thought Leis was more culpable than that. He was the one who helped set the stage for the case by prosecuting numerous cases of obscenity and clearing the area of adult book stores and peep-shows, and was the first county prosecutor to take on Larry Flynt, publisher of Hustler magazine. The Simon Leis Campaign Sign on My Wall: Is it Art? In the Mapplethorpe case, it took a jury of eight only two hours to acquit. And this was a jury of people who’d never to be the Contemporary Arts Center, only some of whom had ever been to a museum at all. Only one of them had ever given to the local campaign for the arts, the Fine Arts Fund—a workplace-based fundraising group like a United Way for the arts. In 2010, as part of the relaunch of the Fine Arts Fund as ArtsWave, we painted six blocks of street pavement on 12th Street in Over-the-Rhine with 1500 people coming together to co-create the mural designed by artists based on community input. 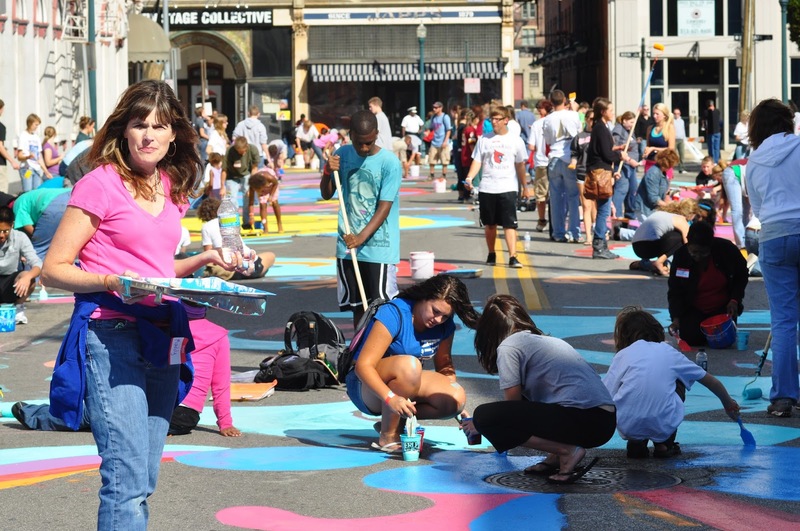 While we were painting, and the street was becoming a vibrant riot of colorful art, someone asked whether we’d hired a helicopter to capture the artwork from above—this being before the days of drones. In fact, we’d tried to find a news helicopter that might let us send up a photographer, but none of the local outlets had a helicopter at that time. And we didn’t have a budget to hire a private operator. Hearing this, someone suggested that I call Sheriff Simon Leis’ office because he had a ‘bird’. Back in the days of the Mapplethorpe fight, the opponents of the Contemporary Arts Center had targeted the Fine Arts Fund. Contributors threatened to withhold corporate contributions to the annual campaign unless the museum was left out as a beneficiary. The museum is said to have voluntarily withdrawn from the campaign rather than forcing a decision that could harm other arts institutions with declining overall funding. Sheriff Leis was largely seen as the driver behind the overall campaign against the photo exhibit. But what the hell, we decided to call the Sheriff’s office and ask about a helicopter for some art photos. The answer? It was a Sunday and they’d have to wait until the ‘aviation team’ was back on Monday and then the Sheriff himself would have to approve. A few days later, a disc of photographs was delivered to ArtsWave. 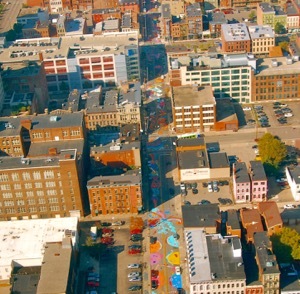 The Sheriff had sent his own photographer up in the helicopter and they flew back and forth capturing multiple views of the streetart. 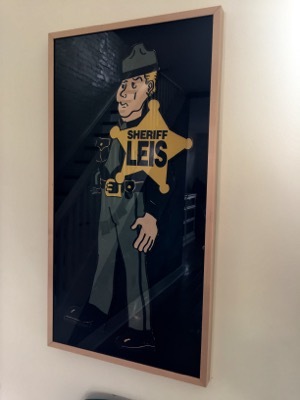 So yes, you might say Sheriff Simon Leis likes art.